After a long gap of almost eighteen months two new reports on the economic impact of Brexit appeared in the same week. Both received wide media coverage for predicting large losses for the UK economy. In fact neither can be viewed as presenting reliable forecasts for a reduction in living standards. In addition, leaked predictions from a confidential government report appeared last week Once again the predictions were dire, but the source of the calculations, and the methods used, remain secret. An important feature of the Referendum campaign was the raft of official and academic reports estimating the likely economic impact of Brexit. All but one of these predicted negative impacts. These could be large, with a loss of up to 9% of GDP by 2030 in the case of H M Treasury. Only one study predicted gains. The slew of negative predictions became known as ‘project fear’ culminating in George Osborne’s threat of an emergency budget to offset the expect large immediate losses in government revenues. Many of these were based on flawed methodology as described here. 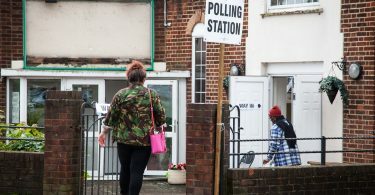 A majority of the electorate appeared to have ignored these all predictions although the huge weight of evidence, and associated publicity, may have increased the numbers voting ‘remain’. Certainly, the majority of ‘remain’ voters stated that economic fears were the main influence on their vote. The inaccuracy of the short-term forecasts, especially the Treasury’s prediction of an immediate ‘four quarters of recession’, has further discredited attempts to forecast the economic impact of Brexit. Relatively little has since been heard on the subject from the main official bodies, the Treasury, OECD and IMF or from academic or commercial forecasters. That is, until recently when two highly publicised reports were issued. One was from the Mayor of London, in retaliation for DEXEU’s failure to publish its promised economic impact reports. The second was from the Government of Scotland which had previously gone quiet on the issue since the collapse in oil prices, but has decided to return to its attack on Brexit. These were followed by leaked details from a DEXEU report, the authorship and methods of which remain secret. The Mayor of London’s report, ‘Preparing for Brexit’, was commissioned from the well-respected economic consultants Cambridge Econometrics (CE), and used CE’s E3ME global model. Myself and colleagues regard this as a plausible model since it is based on economic relationships estimated using actual historic data rather the theory and assumptions which dominate so-called ‘general equilibrium’ models used in most other Brexit studies. The results are similar to those obtained by myself and colleagues using a UK macro-economic model constructed using similar principles. 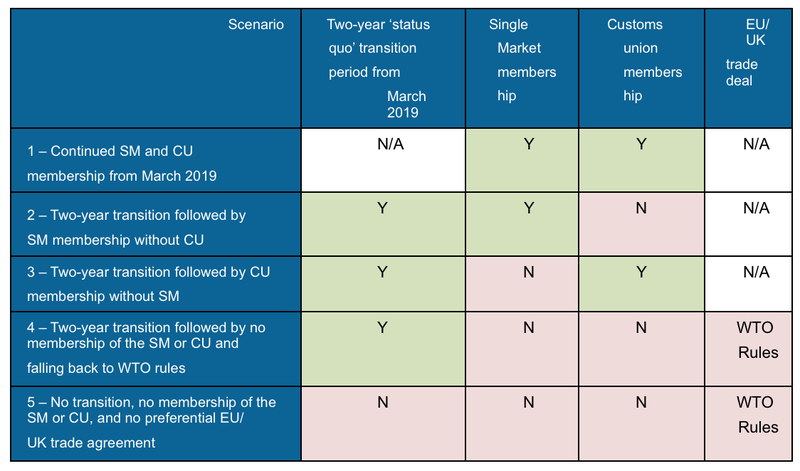 The CE report generated estimates for a baseline of remaining in the Single Market and Customs Union plus four ‘leave’ options as outlined in the following table. Strangely, the CE report does not include a scenario for the UK Government’s preferred position of a 2-year transition period followed by a Canada-style free-trade agreement augmented for financial services. The predictions for each of the four ‘leave’ scenarios are expressed as a percentage difference from the ‘remain’ baseline in 2030. 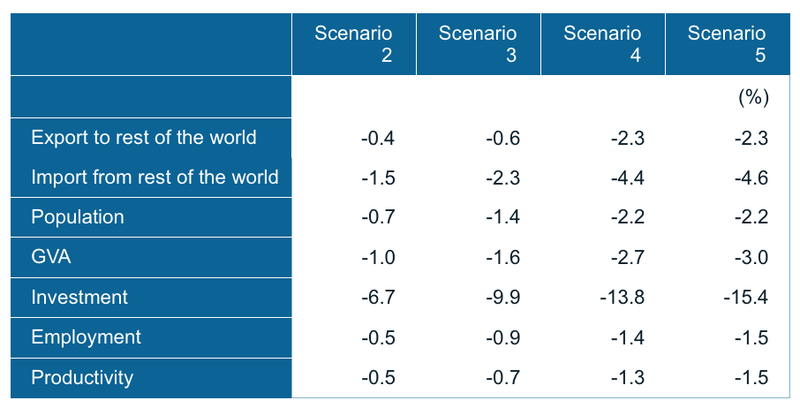 For instance, in the table below, GVA is predicted to be 2.7% below the baseline in 2030 if a 2-year transition period was followed by no deal (scenario 4). (GVA, or gross value-added, is similar to GDP, but excludes indirect taxes like VAT). The media headlines on these results focussed on scenario 5 which assumes no transition, despite the fact that a transition is desired by the UK and appears to have been accepted by the EU. The results in this case were a 3% lower level of GVA and a 1.5% lower level of employment (giving a loss of 482,000 jobs). An important aspect of these predictions was given no prominence in either the Report itself or in the media coverage of the report. This was the fact that per capita GVA (which measures living standards) was predicted to be only very slightly reduced by 2030 in any of the Brexit scenarios. This is not shown explicitly in the Report’s tables but can be seen in the table above by comparing the GVA and Population rows in the table below. In scenario 4 for instance GVA is predicted to be 2.7% lower, and population to be 2.2% lower. Combining these two estimates gives a reduction of per capita GVA of 0.5% by 2030. Presumably, a scenario combining a transition period with a free-trade agreement would give an even smaller reduction in per capita GVA. Such small reductions are well within margins of error over such a long period, and can reasonably regarded as involving little or no change from the ‘remain’ baseline. The population forecasts are based on CE’s assumptions that net migration will fall from today’s level of around 250,000 people per annum to 100,000 due to migration controls. These migration assumptions then influence the forecasts for GVA and employment. What is implicitly happening in the CE forecasts is that most of the loss of output and jobs will be due to lower migration. Since 76% of the 4.3 million extra jobs in the UK over the last 15 years were taken by workers born outside the UK, the CE forecast is on solid ground in predicting that a Brexit-related reduction of job creation would reflect a lower level of migration into the UK. The impact on jobs for indigenous workers would be relatively small. The CE predictions are not very different from those generated by the CBR UK model operated by myself and colleagues at Cambridge and Ulster universities. Our forecast is based on a 2-year transition period followed by a free-trade agreement for goods only (i.e. no special arrangement for financial services). Our prediction is that by 2030 GDP would be 1.2% lower than in the baseline forecast, and employment 2% lower (a loss of 640,000 jobs), but per capita GDP would be higher by 0.6%. The CE Report also provided results for London alone (shown in the table below). In this case the reduction in GVA is less than the reduction in population for all scenarios, indicating a higher level of per capita GVA in London by 2030 whatever type of Brexit is adopted. In other words, Brexit would enhance average living standards in London under any form of Brexit. This conclusion may mean little since the fall in population is based on assumptions, and seems large. It is also complicated by the fact that there is no mention of commuters (who contribute about a million of London’s 5 million workers). CE say that the large reduction in employment is due to the fact that ‘London has a larger proportion of non-UK workers, so border restrictions and a reduction in EU migration are expected to impact London the most’. However interpreted, there is no sense in which the CE report predicts a negative impact on living standards in London. In conclusion, the CE report predicts lower GVA and employment but no substantial reduction in living standards as measured by per capita GVA. In true ‘project fear’ style, the reductions were widely reported but the important point on living standards was ignored. The predictions, whether commented upon or not, can be viewed as plausible. The UK economy is likely to be a little smaller after Brexit, mainly because lower migration will mean lower numbers of jobs and less output. We agree with CE that the living standards of the resident population are likely to be little changed. The recent report by the Scottish SNP Government reiterates its established preference for Scotland becoming an independent state within the EU. Independence was rejected by the Scottish electorate in the 2014 referendum and, in light of the subsequent collapse in oil prices, the SNP has put onto the back-burner its pressure for a second Scottish referendum. In this report it maintains its pressure on the UK Government to remain within the Single Market and Customs Union despite the UK then being unable to influence EU economic policy once it leaves the EU. This characteristically assertive report concludes that ‘The conclusions are stark and unambiguous: in the context of Brexit, Scotland’s future economic prospects are best protected by the UK remaining within the European Single Market and a Customs Union which replicates the terms of the current EU Customs Union’. We might note that the SNP badly needs the UK to remain within some form of the EU. The prospect of tariffs and regulatory barriers between Scotland and the rest of the UK (with which Scotland does four times as much trade as with the EU27), would effectively rule out future independence for Scotland. similar to those of the Treasury, and criticisms of the Treasury’s approach have been ignored. The Scottish Government have their own in-house global model, based on the National Institute’s NiGEM model recalibrated for the Scottish economy. This forecasts demand for Scottish exports for all countries and then scales down post-Brexit demand from EU countries. The degree of scaling-down is the crucial assumption in the entire forecast. In the case of no deal it is assumed that UK loses 50% of its EU export market, despite the fact that the average tariff in this worst-case scenario is only 5% and despite a forecast of a 15% depreciation in sterling which makes exports cheaper and more profitable. This assumption of a loss of half of the UK’s exports to the EU (and hence almost a quarter of all UK exports) is drawn from the so-called ‘gravity model’ trade literature. These studies use a simple technique based on the fact that trade flows tend to be larger when the exporting and importing economies are large and also when they are geographically close to one another. Such studies typically show that trade between EU member states is up to twice as large as might be expected on these ‘gravity’ principles. However, such estimates are an average across all EU members and fail to take account of the fact that the UK does proportionately less trade within the EU than any other state. In fact, the UK is the only EU state (other than Malta) which exports more to non-EU countries than to other EU states. Taking account of this fact reduces the estimated impact of Brexit on UK trade with the EU by about half. The Scottish Government’s failure to acknowledge this leads them to considerably exaggerate the impact of Brexit. An even larger exaggeration comes in calculating a ‘knock-on’ impact from trade to productivity. Most studies assume a large negative impact. When trade is reduced, the assumption is that productivity will be lower. 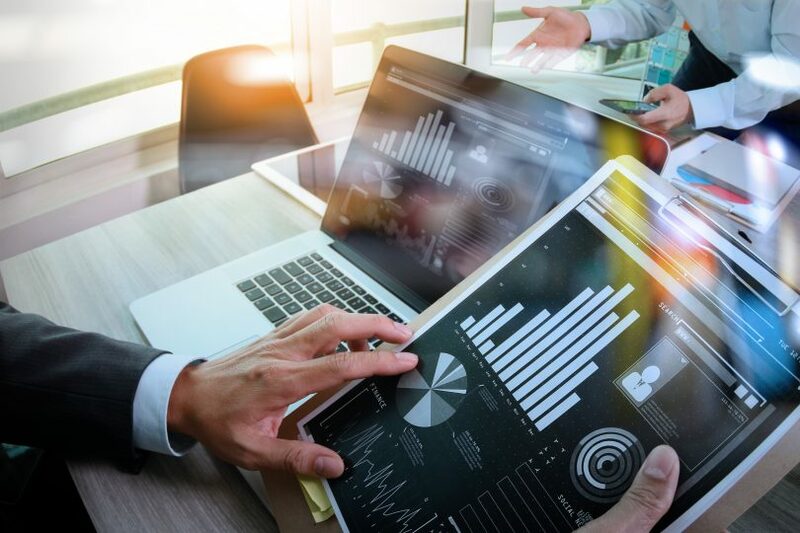 The relationship between trade and productivity is based on empirical studies, but importantly these are studies in which much of the data comes from emerging economies. If the evidence is restricted to rich countries alone, there is little or no evidence of a link between trade and productivity. This productivity ‘knock-on effect dominates the Treasury’s large negative estimate of the impact of Brexit, but the National Institute work (on which the Scottish report is based) leaves out this effect and hence report a much smaller impact of Brexit. The Scottish Government report ignored the example set by the National Institute and decided to add it in, and hence obtain a much larger economic impact. In early February leaks began to appear from a confidential DEXEU report containing new estimates of the economic impact of Brexit. Unlike previous government reports this one contains estimates of the impact at sectoral and regional levels. These sectoral and regional estimates were duly leaked, but the full report remains confidential and no information is available on which officials made the calculations nor what methods were used. The estimates for the economic impact of Brexit in 2030 varied between a loss of 2% for EEA membership and a loss of 8% for no deal on trade and a reversion to WTO rules. These magnitudes are similar to those in the Treasury’s pre-referendum 2016 report on the long-term impact of Brexit. We must assume that the new estimates came once again from the Treasury, and without further information it seems likely that similar flawed methods were used as in the 2016 report. The leaked regional estimates suggested that the least negative economic impacts would occur in London with much larger impacts predicted for peripheral regions. 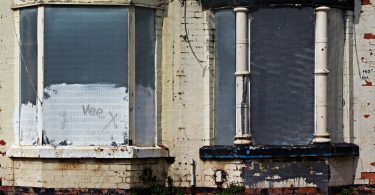 The North East was for instance predicted to lose almost one sixth of its economy under a ‘no-deal on trade’ scenario. In Northern Ireland the predicted loss was close to one eighth under the same scenario. These are implausible estimates. The prediction for the North East presumably implicitly assumes the closure of the Nissan plant in Sunderland despite the boost to competitiveness from the post-referendum depreciation of sterling. The Northern Ireland prediction appears to fail to take into account the potential gains to Northern Ireland’s food producers in GB markets following the loss of markets for Republic of Ireland producers attempting to sell into UK markets with the handicap of large tariffs and an adverse exchange rate. The only apparent concession compared with the earlier Treasury report was a small gain from future free-trade agreements with the USA and China. The previous report pessimistically assumed no gains whatsoever. All of this is completely unsatisfactory, not to say unethical. Sharply negative predictions for Brexit received huge publicity on national and regional media, often stated as fact even in the FT, while no details are available on how the figures were arrived at. Major economics figures, including the Governor of the Bank of England, called for the publication of the report, but the Government has preferred to sit tight despite the apparent damage to its stated policy on Brexit. The preference was to play down the significance of the leaked report rather than face up to its consequences. No one in Government or Parliament has faced up to the criticisms of the 2016 Treasury report, and hence there is little ability to critically assess the leaked report. The Treasury refusal to discuss the criticisms of its earlier report was a breach of civil service integrity, but the repeat of similar predictions leaked from a still confidential report takes the Brexit debate into even deeper levels of unethical behaviour. The Scottish Government reproduces the flaws the Treasury’s 2016 report, and calculates a negative economic impact of Brexit which is exaggerated perhaps by as much as four-fold. These conclusions are then confidently asserted in the report with no hint of caution about what are controversial estimates. Like the Treasury’s report, the Scottish forecasts are likely to be ignored by the majority of voters, not least because scepticism about such forecasts has multiplied since 2016. The Cambridge Econometrics report for the Mayor of London is methodologically much sounder. The problem here is not the estimates themselves, but the prominence given in the report, and hence in media coverage, to negative aspects while ignoring those more favourable to Brexit. Finally, the leaked DEXEU report represents a new departure in the Brexit debate – a confidential report which predicts negative consequences without any indication of who generated the predictions or what methods were used. Needless to say this is a completely unsatisfactory way to conduct government business.